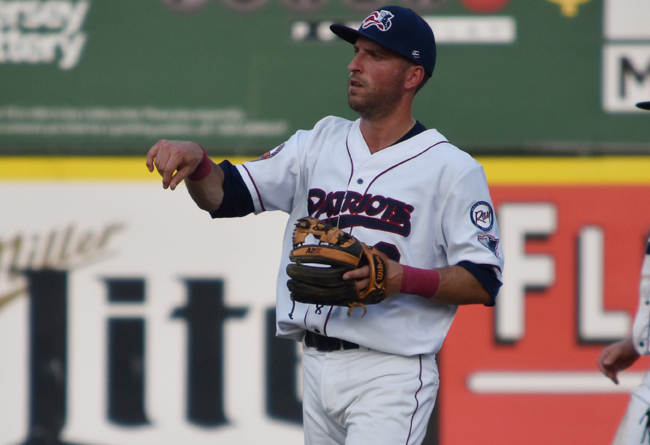 (Bridgewater, N.J., July 15, 2017) - The Somerset Patriots have announced that infielder Tyler Bortnick’s contract has been purchased by the Milwaukee Brewers. He will report to Triple-A. Bortnick was named an All-Star in his first season in Somerset and second in the Atlantic League for his .273 average, 25 runs, 59 hits, ten doubles and 26 RBI in 62 games played. His previous time in the Atlantic League came in 2015 when he spent 52 games with the Lancaster Barnstormers. That same year, he played in 65 games in the Seattle Mariners organization and combined to hit .277 with three home runs, 50 RBI and 16 stolen bases between Lancaster and Double-A Jackson. The Mentor, Ohio native spent 2016 in the Detroit Tigers organization, splitting time between High-A Lakeland, Double-A Erie and Triple-A Toledo. Overall, Bortnick hit .277 with six home runs, 34 RBI and seven stolen bases. Prior to joining the Barnstormers in 2015, Bortnick had spent the previous three seasons in the Arizona Diamondbacks organization at Triple-A Reno. His best season came in 2013, where the utility infielder batted .291 with 33 RBI and 19 stolen bases over 88 games. Earlier in his career, Bortnick enjoyed two seasons in which he stole over 40 bases (2010 and 2011). His 43 steals with High-A Charlotte in 2011 led the Florida State League. Originally drafted by the Tampa Bay Rays in 2009, Bortnick was traded to the Diamondbacks in 2012 in a straight-up deal for Major League infielder Ryan Roberts. The Coastal Carolina University alumnus owns a .278 career batting average with 39 home runs, 370 RBI and 197 stolen bases in his eight-year minor league career. Bortnick becomes the tenth Somerset Patriot to have his contract purchased by a Major League organization this season. Pitchers Logan Darnell (Tampa Bay Rays and Los Angeles Dodgers), Jeremy Bleich (Los Angeles Dodgers), Tyler Cloyd and Ryan Kelly (Seattle Mariners), Aaron Laffey (Arizona Diamondbacks), Vin Mazzaro (Cincinnati Reds), and Mitch Atkins (New York Mets), along with outfielder Jerry Sands (San Francisco Giants) have all had their contracts' purchased this season.